With the end of September, we are fully back in session with the routine of the school year and all the activities that come along with that. That means scenes like these are now a regular occurrence. Even though our weeks are busy, the regular rhythms of a week feel good. Both girls are in ballet this year - with Bea taking her Petit Pas De Deux class (with me!) at the same time Josie takes piano lessons. 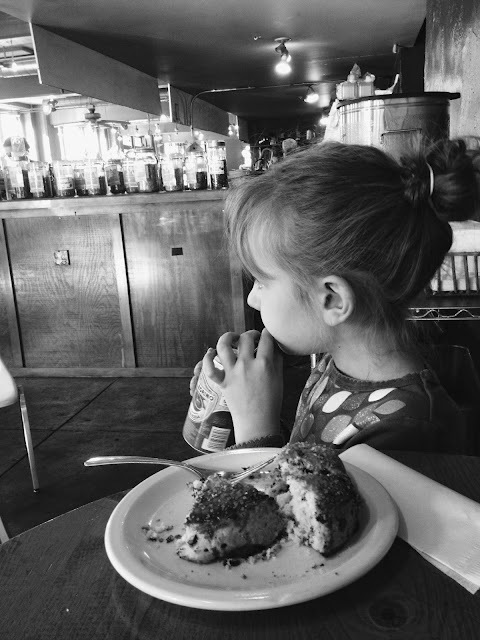 Bonus: Before Josie's ballet class, we stopped into The Coffee Emporium for a scone and sat at approximately the exact same spot where a 1 year old baby Josie smashed her first birthday cake. Josie wanted me to re-tell every detail of that day to her - who was there, what she did, etc. She was fascinated by all of it and really surprised to hear just how many of you were all there. Thanks to all of you for being a part of our lives from the earliest days through now!